Provide comfort for the family of Laura Slominski with a meaningful gesture of sympathy. 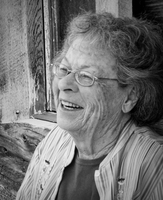 Laura Mae (Mason) Slominski, 86, died peacefully the morning of February 15th at home in the presence of her family. Laura is survived by her children, Michael (Jan) Slominski, Lisa (Roger) Campbell and Shelley Slominski; 6 grandchildren & 11 great grandchildren. She is preceded in death by her husband Stanley Slominski. Laura was born on November 25th, 1932, in Missoula to Ervin and Alta (McFarland) Mason. She graduated from Missoula County High School in 1950 and married her high school sweetheart in September of 1951. They resided in San Diego & Turah where they raised their three children, eventually moving to and establishing Moon River Arabian Ranch in 1969. There they built their home and ranched for the remainder of their days. She lived and died on the land which her grandparents settled in the late 1800’s. Her children remember her as a kind mother who encouraged them with wisdom and compassion. Laura maintained prestigious bloodlines of her beloved Arabians, entering them in local competitions and selling them world-wide. Growing up on horseback, she continued to enjoy mountain rides even into her later years. She was a witty individual who loved equally wildflowers and all animals. When she wasn't tending the animals of the ranch, Laura could be found among their many gardens or scouring the Montana landscape for rare rocks and minerals. Anyone who knew her will miss her fun-loving demeanor and joyful outlook on life. Her relatives and friends will remember her through her imaginative storytelling and descriptive letters. Laura requested there be no memorial service, but that she spend eternity in the mountains of her home. Her ashes will be interred there at a later date. The family requests their privacy, but if you would like to remember her please plant and care for her favorite flower, a yellow rose, in your garden. Donations toward the Multiple Myeloma Foundation are welcome. To send flowers in memory of Laura Mae Slominski, please visit our Heartfelt Sympathies Store. Provide comfort for the family of Laura Mae Slominski by sending flowers. What a lovely lady! I will miss seeing her on Weds. and listening to the adventures of rock hounding and animals on the ranch. She had such a youthful outlook and spirit. Always upbeat even when not feeling well. My prayers are with you as you mourn the loss of your sweet mama. Denise G.